What does your home mean to you? An escape or retreat? Family memories of wonderful times? Entertaining with friends? How you live in and experience your home is of great interest to everyone at Feathers. Creating the perfect custom interior furnishings for you and your home is the essence of Feathers Fine Custom Furnishings. When Dan and Claudia Levinson founded Feathers Fine Custom Furnishings and Fabrics in 1994, they did so with the intent to provide their customers with the highest quality custom designed and manufactured home furnishings. From their previous design business background, this paved the way for the opening of Feathers and it is now a peoples-choice in design and manufacturing of upholstered furnishings, window coverings, bedding and casegoods. Feathers’ clients find out early on in the process that this is not a merely business to Dan and Claudia. This is a passion for design they fulfill every day. The entire Feathers’ expert team prides themselves in unique design and high quality craftsmanship to ensure you receive a product that you are proud to call your own. It all starts off with picking the perfect fabric, and Feathers offers hundreds of high-end designer fabrics, exquisite trims and hardware. You can also provide Feathers with your own fabric to use in designing the perfect sofa, chair, drapery or a luxurious bed ensemble especially for you, your taste and lifestyle. Celebrating 50 Years of Experience… Wiseman & Gale Interiors has set the standard for luxury residential design in Arizona’s finest homes for more than 5 decades. The Company’s reputation was first established by founders, George Wiseman, and Anne Gale. He migrated to Arizona from California, and she from New Mexico in 1959, with her husband Tom Gale. In 1965, they opened their Scottsdale design studio in a location just 100 yards from the current address. Anne Gale, who retired in 2002, is known as the “granddame” of Southwest luxury design. She helped to develop Wiseman & Gale’s eclectic trademark – a sophisticated mix of uncommon product and materials carefully assembled to create bold one-of-a-kind interiors. Wiseman & Gale is a full service design firm. Our studio in Old Town Scottsdale was designed specifically to provide our discerning clientele the highest level of product and service available in the luxury residential marketplace. Included as an exclusive resource for our clients, Wiseman & Gale also has a showroom with a collection of unmatched and ever-changing antiques, extraordinary home furnishings, and accessories which our designers may draw from to complement and complete their projects. Each of our designers is knowledgeable in the key components of any typical residential project. Fratantoni Lifestyles - It's not just a name, but a lifestyle. Allowing people across the world the luxury of having high quality furniture pieces, light fixtures, accessories, and more, for a low price! Fratantoni Lifestyles is the destination for "Do-It-Yourself" decorator enthusiasts. If you need help designing and decorating your home there is no need to worry, Fratantoni Lifestyles has a team of designers and decorators at your service! All you need to do is ask for help and one of our in-house experts will provide you with professional advise! 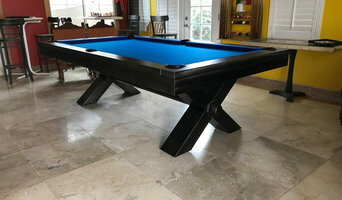 Provider of world class pool tables, game room furnishings, billiard tables, shuffleboard, game tables, foosball, ping pong, arcade games, bars, bars stools, "Everything for your Game Room"
We sell all of our beautiful, handwoven and hand-knotted rugs right here on Houzz Marketplace. Check out our Marketplace profile right here at <a rel="nofollow" target="_blank" href="https://www.houzz.com/pro/naintrading">https://www.houzz.com/pro/naintrading</a>. Since 1998, we deliver handmade oriental rugs and carpets of the highest quality to you – now, even in over 50 countries worldwide. We are able to offer you the best services with our expertise by benefiting from generations of trading with oriental carpets. From the purchase through professional cleaning to individual knotting - we serve all of your wishes around oriental carpets and rugs. In the future, we will continue to focus on our core business by making the online purchase of carpets more tangible and by bringing it even closer to your home. Casa Chic was established by Interior Designer Vicki Bergelt in Scottsdale, AZ She brought Casa Chic together first as a local retail Out-of-the Box Home Decor Store and now to the public for an online Home Accessory Experience. Why shouldn't you be exposed to Hand Selected Beauty! We at Casa Chic get euphoric in everything glamorous and shiny! We search high and low to bring you Unique, Edgy and Chic Home Decor! We have beautiful adornments you will flaunt and your friends will be envious about. If you're ever in Scottsdale, come see us!! Thingz is a furniture and lighting boutique specializing in contemporary and modern decor. Visit our store in Scottsdale! Tierra Del Lagarto is a family owned and operated furniture and accessories store in North Scottsdale. Our 12,000 square foot showroom is brimming with finds from our travels around the world. From upholstery to dining sets, bedroom pieces, and patio furnishings, there is truly something for every room in and out of the home. Travelling and hand-sourcing our goods as a family is our real passion. Every year we go to India, Morocco, Turkey and Indonesia, and we are always trying to cram another country in when we can. Working one on one with artisans and villages all over the world connects us to our products. There is so much pleasure in finding an unusual artifact and making it available for our customers at home. We have met so many wonderful people in our travels over the years, and sharing their stories with our ever-interested clients is a true joy. Nordic American Furniture Design + Manufacture. Beautiful, handcrafted furniture with simple, streamlined form. Functional art that highlights the hard work of the skilled craftsman and beauty of simplicity. Stephen is principal designer and founder of Stephen Lysak Design, a focused design studio specializing in warm-minimalist pieces of modern furniture and accessories. His work merges Nordic simplicity with North American craftsmanship, producing a finely curated collection exuding clean lines, sharp angles, and modern form - making his work a truly distinct brand. Each piece is made to order ensuring proper attention to detail and sustainable, heirloom quality. Sustainability is at the forefront of the design process. Materials are hand-selected and sourced from respected distributors, finishes are natural or low VOC, and waste reduction/reuse is a priority. These small details add up to large-scale change. Stephen Lysak Design is a true North American brand - a conscious brand with positive ethos. "I believe great design is timeless. It inspires us to improve, evolve, and it promotes an overall healthy atmosphere; something I strive to achieve with every creation." Enjoy. For nearly 25 years, Fiesta Furnishings has proudly called Scottsdale home to our furniture business. A visit to our showroom is like stepping back in time, to a time when meticulous craftsmanship and artistry mattered. It still matters to us and still can be found, if you know where to look. Our owner of Fiesta Furnishings transforms her love of travel and treasures into a one-of-a-kind display showroom to share the beauty she discovers. She has hunted high and low for distinctive quality that is a rarity today. The search yields solid, hand-crafted pieces that have a worldly presence, with rich finishes and laborious details found in Italy, Spain, Mexico, England and domestically in the US. A visit to our showroom is as much a visual feast as it is a shopping experience. We're one stop shopping and can take care of your whole home, from custom furnishings to window treatments. Experience Fiesta Furnishings and see why we are, A World Apart. 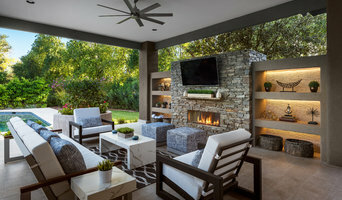 Debra May Himes, ASID, LEED AP has been practicing interior design in the Greater Phoenix Area and several parts of the United States since 1975. She has been fortunate to have received many awards for her work in residential design, commercial design, furniture and product design, and feels blessed to be working in a field she is so passionate about. Debra is a native of Arizona and loves the strong and rugged Arizona desert, which is reflected in many of her designs. She enjoys exploring her clients design needs and delivering great design solutions for those special projects both for residential and commercial environments. On one of her projects, and contractor also working on the job exclaimed that Debra ha “nailed” what her clients expected. That objective is what Debra works for on each one of her projects. Debra holds a Bachelor’s degree in Interior Design, is NCIDQ Certified, is a LEED Accredited Professional, and is a Past President of the American Society of Interior Designers (ASID), Arizona North. From The Inside Design is a business set on making your ideal home or work space come true. Allow your dreams of elaborate backyard seating areas, elegant dining spaces, and relaxing bedroom oases become a reality while working closely with our company to get your space exactly as you've been envisioning it! Start your research right here on Houzz. Read through professionals’ profile pages to find out important details, like how long a manufacturer has been in business. Look at reviews by design professionals and find out which furniture makers offer the best customer service. Are you looking for condo-size furnishings or working with an oddly shaped room? Necessity is the mother of invention, so opt for a custom piece made by an experienced Arizona furniture maker. Here are some related professionals and vendors to complement the work of furniture & accessories: Interior Designers & Decorators, Artists & Artisans, Kids & Nursery, Closet Designers and Professional Organizers, Bedding & Bath. Take your time on any buying decisions. If contemporary is your style, don’t buy something traditional because it’s on sale. Many Arizona home furnishers offer interior design consultations or room planning guides to get you started. Whether you decide to work with a home decor specialist or to become your own expert, it’s important not to rush the furniture-buying process. Visit plenty of Fountain Hills, AZ showrooms and stores so you can feel comfortable with your purchase. Find furniture and accessories manufacturers, showrooms and retailers on Houzz. Narrow your search in the Professionals section of the website to Fountain Hills, AZ furniture and accessories, then choose the nearest metro area for showrooms and retailers. Or you may want to look through Arizona photos to find designs you like and contact the furniture manufacturers and showroom galleries directly.